Posted in General Health & Wellness on June 07, 2012. Last modified on March 28, 2019. Read disclaimer. With mounting concerns about childhood obesity, it is increasingly important that children to get outside and play. Unfortunately, however, time spent at the school, public park, daycare, fast food or even at-home playgrounds always includes a risk of injury. Pay attention to your children while they are playing. There is no substitute for supervision. It is the responsibility of the caregiver to ensure that the playground equipment is not faulty, children are using equipment properly (not sliding headfirst down slides, facing the wrong way on the teeter-totter or standing on swings, for example), and kids are not playing too roughly. Since falls to the ground are the most common cause of injury, playground surface is an important consideration. Concrete, asphalt, blacktop or even indoor/outdoor carpeting under any playground equipment are unsafe. These surfaces cannot cushion the blow of a child moving full speed towards the ground. Grass is also not the best choice as it is eroded by weather and has difficulty withstanding wear and tear from usage. Wood chips, sand, loose gravel and rubber mats are considered safe materials when they are used properly. The playground surface should be free of sticks, rocks, glass, and metal. No parent wants to have to get their child a tetanus shot due to a puncture wound at the playground. Playgrounds should have separate areas that are clearly identified for toddlers (under age 2), preschoolers (ages 2-5) and school-aged children (ages 5-12). Each section should contain equipment deemed appropriate for its appropriate age group only. Having an adventurous 3-year old play on equipment designed for older kids is a recipe for disaster. And, though it may not seem like it, equipment and spaces designed for toddlers can be hazardous for older kids. 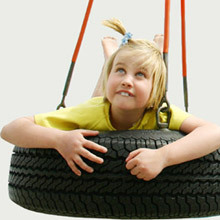 Watch out of equipment with moving parts such as swings, merry go rounds and see-saws. These can catch clothing or pinch fingers. Smaller children should be taught to steer clear of the swings and to give other children enough space to play without causing bumps and bruises. Equipment determined to be unsafe for playgrounds includes monkey bars, swinging ropes or anything with potential to cause strangulation in the event of a fall or that is likely to deteriorate or weaken over time. Be mindful of spaces where a child's head could become entrapped. The summer time brings with it wonderful warmth and heat. This same heat which prompts children to play outside can be dangerous if forethought is not exercised. Playground equipment made of plastic and metal will heat up in the afternoon and can lead to contact burns. Additionally as much as Vitamin D is a gift from the sun, take care of baby's skin with sunscreen to prevent painful sunburns. The U.S. Consumer Product Safety Commission (CPSC) says that the leading causes of playground injuries, in order, are: falls: 44%, equipment problems (structure breaking or tipping over, sharp edges, improper assembly, etc. ): 23%, becoming trapped, and colliding with equipment or other kids. The leading cause of playground deaths is strangulation. The best to avoid these injuries is to keep a close eye on your children and try to anticipate playground problems before they happen.